Last November, Delhi faced its worst public health emergency because of toxic air pollution. The level of PM 2.5 — tiny particles that damage the lungs — was 14 times the safe limit. Air was foul; deadly and dangerous. It was death by breath. Today air pollution is rising, not just in Delhi, but across Indian cities. Air pollution is a great leveller — it affects the rich and the poor. This is not a problem where the rich can protect themselves by drinking bottled water, or by installing air purifiers in their homes. Dirty air is pervasive and all prevailing. We have to clean up for all our sakes. The good news is that we are beginning to win this battle for clean air, bit by bit. The fact is we know the sources of pollution — more or less. We know that in our cities dust is always there. India, after all, is an under-construction country. The only way to control this dust is to ensure that roads are paved, water is sprinkled regularly, and all protection is provided to areas where there is dust.The problem is this requires enforcement by local authorities, it also requires huge amounts of water--a scarce and precious resource. But the good news is that dust is not toxic, per se. It is a visible problem, but not a noxious one. There is now clear evidence of the difference in toxicity and therefore on human health of particles from ‘dust’ as against the particles that are emitted from combustion sources — vehicles, power plants and industries. So, this is where our focus needs to be. Here also there is some good news. The advancement of BS VI fuel and vehicle emission standards is a game-changer. This has happened against the wishes and wants of the powerful automobile lobby. By 2020, Indian fuel and vehicles will have the most advanced emission control technologies. More importantly, diesel-fuelled vehicles from cars to trucks will have to meet the same standards as petrol vehicles. This is the long-term change that air pollution control demands. But the immediate agenda is to ensure that BS IV vehicles come on the road from April 1. This should be easy, given the fact that cities like Delhi and Mumbai have had BS IV vehicles from 2010 onwards. But the fact is BS IV quality fuel was not available across the country. Automobile companies hid behind this and continued to sell outdated and extremely polluting trucks and taxis. Now, when the ministry of petroleum and natural gas has ensured that high quality fuel is available across the country, industry is saying they are not ready. Why? Because they have ‘huge’ inventories that need to be first sold, before they will ‘sell’ clean vehicles. There is a loophole which they want to exploit. The ministry of surface transport and highways notification says companies will start manufacture of these vehicles from April 1. And so now they can easily ramp up production of dirty vehicles and keep selling till stocks are exhausted. This when they have sufficient time to make the change in their production lines. Enough of these skirmishes. The biggest win of this winter is the Supreme Court nudging the government to prepare India’s first smog alert system. There is now a framework to push action. This needs to be lauded and implemented. This smog alert — called the Graded Response Action Plan — has been notified by the ministry of environment, forests and climate change. It has many firsts. First, it recognises that there is a level when air pollution becomes a public health emergency. The plan creates a new category in the air quality index, for this situation and lists actions that will need to be taken. These include the dreaded ‘odd-even car rationing’ scheme as well as ban on construction and entry of polluting trucks into pollution hot spots, like Delhi. These are not measures that get taken every day or lightly. These are emergency actions for drastic control of pollution. Second, it recognises that we live in common air-sheds. 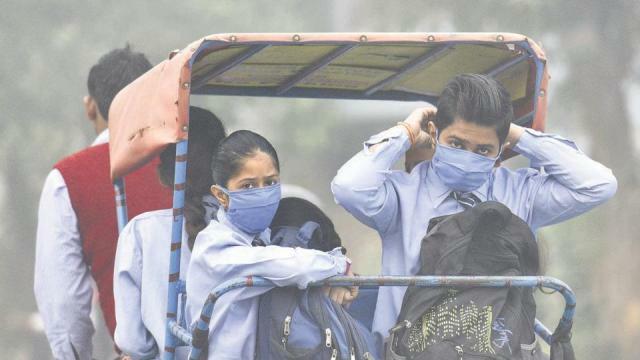 Delhi cannot get clean air unless actions are taken at the regional level, which in this case is a defined administrative unit called the National Capital Region. So, for the first time, the plan for Delhi is applicable for the entire region.This winter began with a public health emergency, the government acted and at the end we have had a better winter than the previous one. Till the first week of February, the levels of pollution are lower than last winter. This is also because nature has been kinder to us — more wind, less cold and less inversion. But still something has worked. Take heart from this. And ask only that we must do more, much more. Because this battle for clean air is a battle for our life.